Patients who are experiencing symptoms of peri-implantitis and gum disease in Elmhurst, IL, can now turn to Dr. Amarik Singh, DDS, MS, a noted periodontist with Periodontal Implant Associates. Dr. Singh is experienced in the REPaiR protocol, which is designed specifically to treat patients with infection around their dental implants, and is now accepting new patients for the treatment. Dr. Amarik Singh, a celebrated periodontist with Periodontal Implant Associates, is pleased to announce that he is now accepting new patients suffering from gum disease in Elmhurst, IL, who may be in need of the REPaiR implant protocol. This treatment uses BIOLASE® WaterLase® laser technology to target gum disease around dental implants, a condition known as peri-implantitis. To keep patients from losing their implants, Dr. Singh recommends receiving the REPaiR protocol. This protocol was designed specifically to help clear away disease and allow patients to heal, saving their implants. It involves using minimally invasive laser technology to eradicate the bacteria causing disease and stop the damage from progressing. This allows the bone and soft tissue to heal and for the supportive tissues around the implant to become strong enough to maintain the load required of them. If left untreated, gum disease and peri-implantitis could cause patients to lose their implants. Patients should always seek qualified treatment before the disease progresses and they lose a dental implant. 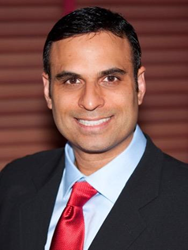 As a board-certified periodontist who specializes in periodontal care and dental implants, Dr. Singh has placed over 15,000 implants and is happy to have dedicated his practice to helping improve his patients’ lives and progressing in his field. Those who would like to learn more can contact the doctor by calling 630-424-9404.